Silky, smooth, and soft, Quilted Northern Ultra Plush toilet paper offers 3 silky layers of comfort for the clean feel you expect and the luxurious feel you desire. Quilted Northern Ultra Plush bath tissue is the only premium toilet paper with 3 layers of tissue. The Quilted Northern signature emboss delivers the softness and strength you love. Quilted Northern Ultra Plush toilet paper is flushable and septic safe for standard sewer and septic systems. Quilted Northern toilet paper is Sustainable Forestry Initiative (SFI) certified. For more than 100 years, Quilted Northern bathroom tissue has stood for softness, strength, and overall quality and comfort. Get this brand you can trust delivered to your door for up to 15% less with Subscribe and Save option. This is a bulk pack of 48 Quilted Northern Ultra Plush double toilet paper rolls, equivalent to 96 regular rolls. Each roll has 154 sheets for fewer roll changes. The rolls are sized to fit standard dispensers. 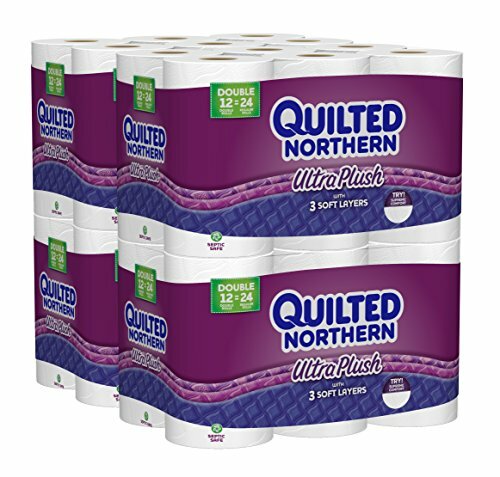 This is a bulk pack of 48 Quilted Northern Ultra Plush double toilet paper rolls, equivalent to 96 regular rolls. Each roll has 154 sheets for fewer roll changes. The rolls are sized to fit standard dispensers.